Pure Land Buddhism (PLB) was an original pagan tradition which contained the recurring themes of advancement, death and resurrection into the perfected state. In the case of PLB, this required the death of the devoted and 'pure' individual who was then reborn into the 'pure land' where the Amitabha (infinite light/life) Buddha resides. This is the place where the individual is able to spiritually advance freely and achieve enlightenment in a short amount of time compared to being alive [my note this is corruption of the sutra as the dead do not advance spiritually]. Nonetheless, there is much allegory in the PLB mythos due to it's originally Satanic roots. As HP Don has mentioned on this topic, the infinite light Buddha Amitabha is Satan in his symbolic form an PLB is at least 15,000 years old, according to western scholars who specialise in the eastern texts. Traditionally, Amitabha is shown as red in colour, eternal youth surrounded by peacock imagery. This is how our God Satan is symbolically depicted around the world, especially the case with South India/Sri Lanka where he is depicted as the resurrected/reborn Siva, the kumara [skanda]. The descriptions of the pure land through the sutras that PLB originate from are allegorical for the perfected state. Although the corruptions by the jooz have made everything about this religion literal, there is enough of the original symbolism for people to understand. Current PLB is just xianity of the east, it teaches people to give up on the left hand path (the hard path as described by some advocates of PLB) and focus on the right hand path (the easy path as described by advocates of PLB) because all they have to do is show faith and devotion in the Buddha and they will be guaranteed rebirth into the pure land although PLB does contain specific mantras and visualisations that individuals can also employ to assist in the entry of the pure land (all of which are corrupted). The pure land is a place where the Dharma rules supreme and individuals will be able to easily advance towards Nirvana (enlightenment). I also note that this pure land is said to exist in the west (where the sun and moon set) and is symbolic of the return to the Tao, or primordial source. One needs the eight fold path to advance, become reborn (resurrection) into the pure land (perfection). Just another way of expressing the path towards achieving godhood. That is the point of this specific tradition as with all other pagan traditions of the Gentile world. The Buddhist trinity comprises of the Amitabha Buddha and his assistants Avalokiteśvara (Guan Yin to the Chinese or Chenrezig to the Tibetans) and Mahasthamaprapta. The original purpose of the trinity are identical in function to other trinities as symbolic representations of different alchemical stages in the perfection of the soul. The Amitabha Buddha is essentially an archetype for the perfected individual. It is in the name and the intention. In Vajrayana/Tantric Buddhism, the mount of Amitabha is the peacock and he is also shown to be holding or sitting on a lotus as well as being completely red or pale. Avalokiteśvara is portrayed in many different ways. The deity is genderless but has been depicted as either male or female (depending on the specific tradition). The picture above depicts Avalokiteśvara in the god's Tibetan Chenrezig form. Note the mala beads in the shape of the number 8 in the god's left hand and the flower in the right hand. Both have important spiritual symbolism which those who have opened their eyes can easily see. I feel that this god may have also be inspired by Lady Astaroth and that those who are connected to the different forms of Avalokiteśvara (perhaps Guan Yin or Chenrezig) may have her as their Guardian Demon but that is just a personal belief. 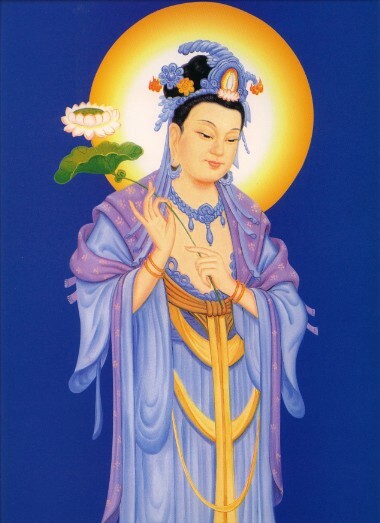 Avalokiteśvara in her Guan Yin form below (Buddhist Trinity picture, the god on the right) also holds the symbolic grail in her right hand and a feather in her left which represent the soul and the lightness that naturally comes from spiritual advancement. Mahasthamaprapta on the left of the trinity picture is also holding a lotus flower. The Bull is sacred to Avalokiteśvara in some of her incarnations which is partially where this no eating beef corruption comes from. Mahasthamaprapta is also a genderless god who is portrayed as either male or female depending on tradition. In some sects the god is shown to be blue coloured (like Vishnu) whereas in others the god is shown to be female and pale (like in Chinese Buddhism). This god is also said to symbolise the moon in the trinity with Avalokiteśvara symbolising the sun and Amitabha symbolising the fusion of these aspects into infinite light/life, the perfected individual who has achieved the Buddha state. Last edited by High Priest Lucius Oria on Mon Dec 18, 2017 6:15 am, edited 2 times in total. Thank you for sharing HP Lucius, its really great to see how deeply connected the Asian race is to Satan and the Gods. I also believe amitabha is satan.in some sutras Shiva is considered a emanation of adibuddha avalokiteswara//amitabha.he emanates all the Vedic gods . Also amitabha is highly revered in lamaism and lamaism uses tummo(Kundalini raising )and sexual yoga .they also believe in the self (atleast the shentong do)and not annihilation of the theravadan Buddhists. Many Delogs have been dead for days to 3 weeks in the case of Shugsep Jetsun and they visited the Sukhavati of amitabha,the copper mountain palace of guru rinpoche,and yulokod of White tara ! One thing I notice in buddhist NDEs(Thai or Tibet) VS Christian NDEs is that the former are usually DAYS long while the latter at most a few hours dealing with enemy ETs and visions and Tulpa thoughtforms. I just read the Delog story of Dawa Drolma-dead for 6 days who visited the pureland.I truly believe that the pureland is true.shugsep jetsun also visisted and was dead for more than two weeks. unlike christian NDEs I notice pureland ones tend to be for days whereas XTian ones dealing with enemy ET visions are of lesser duration. High Priest Lucius Oria wrote: [my note this is corruption of the sutra as the dead do not advance spiritually]. If someone died and is not reincarnated yet, could this person/soul [for example ss which achieved raising kundalini, but not magnum opus] through invocation help/control advance a newer ss ? As exchange take 1/3 of the gained energy so both advance futher? In a sport exampel someone lazy would be invocate a marathon runner, the runner would help/motivate/ runn for him (don´t know how far invocation can go). Both could gain. Thanks for your sermon.